Land and water resources are managed and used effectively for sustainable productivity and environmental protection. 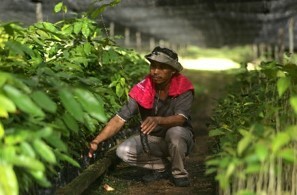 Forests, agroforestry and trees are utilized and integrated for the transformation and development of agri-food systems. Agrobiodiversity is effectively managed and utilized for increased agricultural productivity, efficiency and sustainability. Biotechnologies and related regulatory systems are promoted and applied for improved productivity, nutritional quality, and sustainability of agri-food systems. Policies and strategies for managing (minimizing) price and market risks in agriculture and agri-food systems are developed and adapted. Tools for coping with uncertainties arising from the effects of climate change, sea level rise, natural disasters and man-made catastrophes are developed and improved. Systematic processes of and partnerships in biosecurity at borders and on farms in preventing and managing the spread of transboundary pests and disease are developed.